These are NOT your mother's fabric markers. 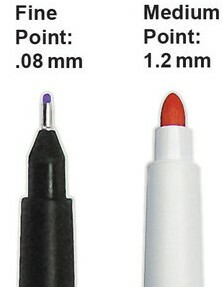 The color flows smoothly out of the tip with no dragging or skipping on the fabric, even when using the fine-liner. Washfast and permanent after heat setting with a dry iron and formulated with the most lightfast, archival pigments, Tee Juice also leaves fabric completely soft to the touch. Tee Juice is great on T-shirts, jeans, canvas, quilts, tennis shoes, paper and more!